Perhaps one of the most notorious speeches in South Yorkshire was when then Labour party leader Neil Kinnock came to the Sheffield Arena in 1992 for an election rally. 10,000 people gathered on 1st April (ironically April Fools day), to hear Kinnock give a rallying speech, oozing confidence and using the powers of persuasion to encourage the country to change its Prime Minister - to him! Opinion polls were mixed throughout the election rally whether the Conservative party would remain in power. Kinnock made a big impression, he flew in to Sheffield via helicopter. When you view the BBC archive footage look out for a rather young looking Gordon Brown, John Prescott and Robin Cook entering the arena alongside Mr Kinnock. 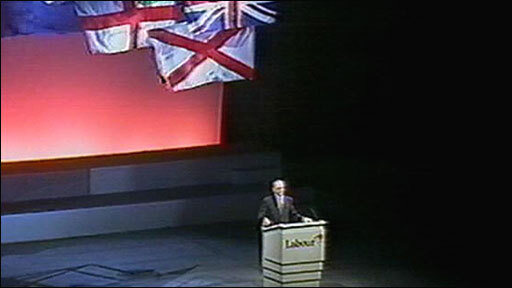 Before Kinnock's main speech his warm up acts were John Smith, who later that year replaced Kinnock as Labour leader. Mr Smith passed comment on the current economic state in 1992, saying the Conservative party would have a box office hit with 'Honey I Shrunk the Economy'. Famous Sheffield man Roy Hattersley then took to the stage and said, "With every day that passes, Neil [Kinnock] looks more and more like the real tenant of number 10 Downing Street." Kinnock then took to the stage, walking on stage to My Land, Your Land by Michael Kamen as walked up to the podium he shouted to the crowd, "We're all alright" which he repeated enthusiastically working the crowd. "Colleagues, friends, we are on our way to victory. In nine days time Britain will have a Labour government" which was followed by a grand applause. We will just carry on fighting for the British people, that is our mission and that is our purpose." The General Election was held on 9th April 1992 and the Conservative party remained in power. "I think Neil Kinnock's speech probably at its time was really good because if you were one of the audience you were probably fired up because of previous events that happened before he came on stage. "So when Neil stepped on stage you might not have noticed how embarrassingly cringeworthy he was being at the time. It is only with the benefit of hindsight and that it was recorded that we look back on it and think it was a bit, 'Ooh that's a bit cringeworthy. "Because Kinnock had that captured audience who were there to specifically see him, in that environment the crowd are warm and that would make the speaker [Neil in this instance] grow in confidence. "Modern technology is everywhere, from mobile phone cameras/videos and the internet and we need to be aware when we're doing public speaking. This applies no matter the audience size, from speaking to thousands of people to a small wedding, think who is going to see it what you are going to say. "We have to understand why we are giving a speech. Speeches usually fall under three categories; inform, persuade and entertain. "Often we can get confused though. It's important that you get the focus right. Neil Kinnock was there to persuade the people who were there and also other potential voters who were watching."